The ECCP provides a number of advertising opportunities to ensure that your company or brand has excellent visibility among its member companies. With this powerful marketing opportunity, you’re sure to benefit from our garnered market and network through whichever publication you select for promotion. We have two (2) types of Digital Media Platforms that are open to advertisements as described below:  The weekly ECCP membership newsletter,eccp@work and  the ECCP Official Website. There are four (4) campaign duration options for advertisements: Monthly (1 month), Quarterly (3 months), Semi-Annual (6 Months), and Annual (12 Months). Bigger savings are available when you choose to advertise for a longer campaign period. Further discounts are also available for ECCP Members. 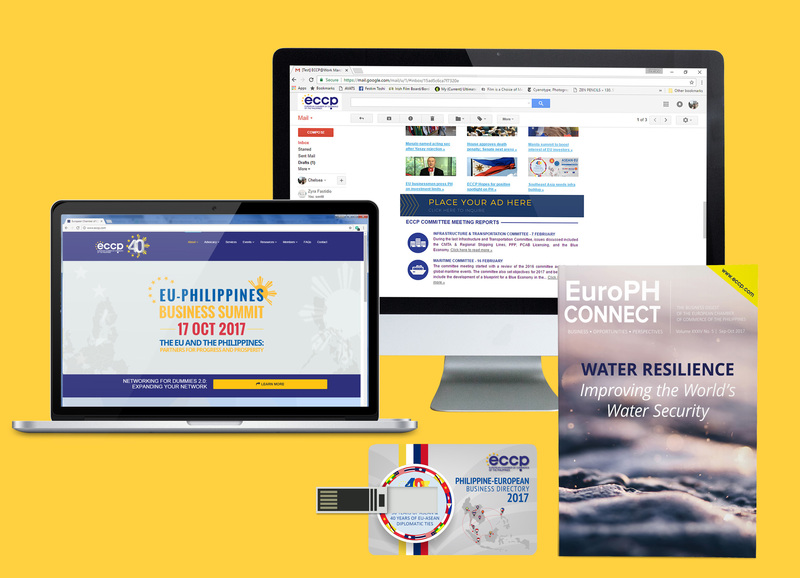 ECCP.COM serves as the official website of the European Chamber of Commerce of the Philippines and the central repository of information of the Chamber. The Website is constantly visited by a pool of business-oriented individuals from a wide-range of industry sectors. It has an average traffic of 5,000 total monthly visits with 4,000 being unique visitors and 10,000 monthly page views. Extended Full Banner (468x60) pixels. The eccp@workNewsletter is an exclusive newsletter sent on a weekly basis to ECCP Members. The ad material can be in PNG, JPG or GIF hyperlinked to a website of your choice and can be changed depending on your campaign. The EuroPH Connect Magazine is a bi-monthly Membership Magazine containing the most relevant issues surrounding Philippine and European Businesses. Advertise in the EuroPH Connect Magazine and reach out to top-level executives and decision makers. The magazine is distributed to ECCP members such as Executives, Diplomatic Missions, Government Agencies, International Organizations, and Foreign-Based Companies both in the Philippines and Europe, as well as in ECCP Events. For more than 30 years, the Philippine European Business Directory has been circulated to all of the ECCP’s local and foreign members, and to the Chamber’s regular clients and partners. It is considered as the first choice of reference by European and Philippine Executives in acquiring business contacts. The directory contains detailed profiles of each ECCP member coming from various sectors, and is one of the avenues that generates business contacts between ECCP members and clients. This is why advertising with us in the PEBD is one of the best ways to boost your company’s visibility in the European Business Community and to promote your products and services. Start maximizing your business potential through advertising with ECCP and its vast business network! Check out our Publications page to know more about each advertising option. For inquiries, you may contact us at publications@eccp.com.